America’s transportation system is the backbone of its economy, connecting households to employment, healthcare, and education and supporting the movement of goods and services across supply chains. This system while indispensable is facing mounting challenges in traffic and congestion, decaying infrastructure, over-dependence on foreign oil, and in many communities a lack of infrastructure for public transit, cyclists, and pedestrians. As Northeast states increasingly invest in clean energy and transportation, tens of thousands of new jobs in fields such as science, technology, engineering, and math (STEM); public transit; and construction will be created. The evolving landscape of transportation technologies, from EVs to autonomous vehicles, will require new educational programs, training, and competencies. 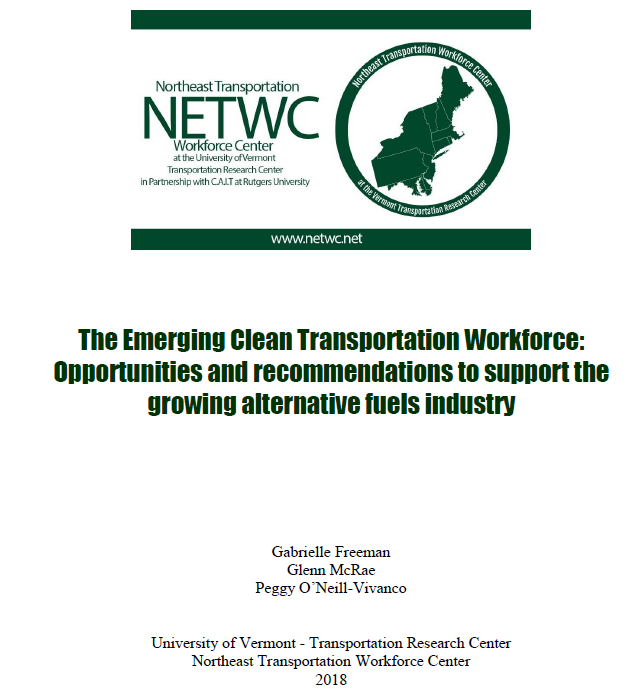 The NETWC has prepared a white paper to examine what education and training programs exist today to support the alternative fuels transportation industry, and provides recommendations on further building out a workforce pipeline to meet anticipated growth. Job seekers should read on to discover what training and education opportunities are currently available, while educators and workforce development professionals are provided with recommendations on how to provide more training and education programs to keep pace with the growing market for EVs and other alternative fuels.